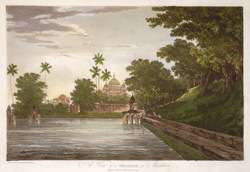 This is plate 17 from William Hodges' 'Select Views in India'. Maner is a town on the bank of the River Son near its confluence with the Ganges. The mosque is part of a compound containing the tomb of Shah Daulat 1616, and was built by a local ruler during the reign of the Mughal emperor Jahangir (1605-27). Hodges compared it to a Gothic cathedral because the entrance featured what looked like colonettes and a pointed arch. He also found that its "majestic dome", with its inverted curve, was more pleasing to the eye than the crowning cupola popular in Europe.